The Killingly Energy Center (KEC) continues to make progress as the project moves forward through the permitting process. The Connecticut Siting Council (CSC) continued its review of the KEC on April 4, conducting a public field review and site walk at the proposed site of the project on Lake Road. Following the field review, the CSC held an evidentiary hearing in the Killingly Town Council Chambers, followed by a public comment session. The public comment session attracted more than 75 residents, with many providing testimony to the CSC. While there were many questions and different points of view expressed, the evening was marked with thoughtfulness and mutual respect for others with differing opinions. With the public comment portion concluded, the next step in the process will be the continuation of the evidentiary hearing, which will be held at the CSC offices in New Britain at 11 a.m. Thursday, April 18. The public is invited to attend. NTE will continue to keep you updated on our progress and any additional meetings that may be scheduled. This month marks the 10th anniversary of NTE Energy, and as part of our celebrations we’ve unveiled a new logo that highlights how NTE’s natural gas and solar energy offerings complement one another, contributing to a cleaner, greener environment. Visit www.nteenergy.com for more information. For permits, documents or other information about the Killingly Energy Center project, visit www.killinglyenergycenter.com or contact Tim Eves at (813) 503-2991 or teves@nteenergy.com. NTE Energy secured a capacity supply obligation (CSO) in the ISO New England Forward Capacity Auction (FCA 13) Feb. 4, allowing NTE to continue with the application process for the Killingly Energy Center. The facility will also support the integration of renewable energy resources and will address regional concerns about seasonal power reliability, he added. In conjunction with the receipt of the CSO, the Connecticut Siting Council (CSC) voted unanimously to grant NTE’s motion to reopen its docket seeking certification of the facility. On Feb. 26 representatives from NTE provided an update and answered questions from the Town Council regarding the schedule for the continued development of KEC. Permits and other documents related to the project may be viewed online at www.killinglyenergycenter.com. The next step in the process will be a visit from the CSC to Killingly on April 4 to complete a 1:30 p.m. public field review at the site, followed by an evidentiary hearing at 3 p.m. and a public comment session at 6:30 p.m. The public is invited and encouraged to attend these sessions. Both the evidentiary hearing and the public comment session will be held in the Killingly Town Council Chambers. For more information about the Killingly Energy Center project or NTE Energy, please feel free to contact Tim Eves at (813) 503-2991 or teves@nteenergy.com. The New Year was off to a busy start for the Killingly Energy Center (KEC). During January, NTE Energy filed its motion to reopen KEC’s Connecticut Siting Council (CSC) docket seeking certification and completed our Environmental Justice (EJ) Final Report. Both documents can be found online at www.killinglyenergycenter.com. NTE is also busy preparing for ISO New England’s February Forward Capacity Auction (FCA 13) that is held each year to ensure that the New England region has the energy resources needed to meet future power demands. If KEC receives a capacity supply obligation (CSO) from the auction, the siting council will decide on the motion to reopen and set the schedule for the certification proceedings. Through its Tax Stabilization Agreement and Community and Environmental Benefit Agreement with the Town of Killingly, the Killingly Energy Center will become the town’s largest taxpayer, contributing more than $115 million to the town and the Williamsville Fire District over the 20-year term of the agreement. KEC is also contributing an additional $5 million for scholarships and other town projects. NTE will continue to keep you updated on our progress and any meetings that may occur. Happy New Year! This will be a busy year for the proposed Killingly Energy Center. In February, we will be participating in the Forward Capacity Auction held annually to ensure that the New England region has the energy resources needed to meet future power needs. We are also preparing to go before the Connecticut Siting Council later this winter. On December 10, 2018, the Department of Energy and Environmental Protection completed its review and issued the project’s minor modification air permit. A copy of the permit is available for public review at http://www.killinglyenergycenter.com, along with all other applications and permits related to the project. The new year brought a new source of cleaner, more efficient power to the Carolinas, when four new communities began receiving power from NTE Energy. January 1 marked the beginning of 20-year power purchase agreements between NTE and the North Carolina communities of Concord and Kings Mountain, and the South Carolina communities of McCormick and Greenwood. In each case, the communities opted to end long-term relationships with their previous power supplier in favor of agreements with NTE that local officials say will generate significant wholesale price savings and ensure greater price certainty for years to come. The holidays were made a bit brighter for four North Carolina towns, as residents learned their electric bills will be going down thanks to the towns’ agreements with NTE Energy. At a time when electricity rates are rising across North Carolina, residents of Black Creek, Lucama, Sharpsburg and Stantonsburg learned their electric rates have been cut 9 percent as a result of savings the communities achieved by terminating their longstanding contracts with Duke Energy in favor of cost-saving power purchase agreements with NTE Energy. Happy Holidays! As 2018 draws to a close and a new year fast approaches, the Killingly Energy Center looks forward to participating in the 2019 forward capacity auction. Held each February, these auctions ensure that the New England region has the energy resources needed to meet future power needs. We are also preparing for future Connecticut Siting Council activities, while the Department of Energy and Environmental Protection reviews the project’s minor modification request. A copy of the request is available for public review at http://www.killinglyenergycenter.com, along with all other applications and permits related to the project. Once completed, the Killingly Energy Center will be among the Town of Killingly’s largest property tax payers, contributing more than $100 million to the town over 20 years. Under the Community Environmental Benefits Agreement (CEBA), the Killingly Energy Center will provide $5 million that the town may use for scholarships and needed community projects. The Killingly Energy Center will fund and construct needed infrastructure improvements that benefit both the town and the project – including replacing older natural gas pipelines, connecting neighboring water systems and enhancing existing roadways. NTE Energy’s Kings Mountain Energy Center achieved an important milestone Nov. 6, when the plant surpassed 1 million megawatt hours of power delivered to the electric grid! Killingly Energy Center’s minor modification request is currently under consideration by the state Department of Energy and Environmental Protection. A copy of the request is available for review at http://www.killinglyenergycenter.com, where site visitors will also find copies of all applications and permits related to the project. As plans move forward, NTE Energy will continue to keep the community informed regarding the development of the Killingly Energy Center and the many economic and environmental benefits that will result from its construction. Once completed, this highly efficient natural gas-fired facility will be capable of providing 500,000 homes with cleaner, reliable and affordable electricity. Students participating in the Middletown (Ohio) Schools’ STEAM program had a chance to learn more about the power industry Oct. 24, when NTE Energy Senior Vice President Tim Eves spoke to students and parents about the Middletown Energy Center and careers in the energy industry. Approximately 60 students, teachers and parents attended the event, which also featured hands-on activities for the kids. In addition to being a corporate sponsor of the STEAM program – which focuses on science, technology, engineering, art and math – NTE is working with local teachers to develop an educational outreach component that will use hands-on activities to introduce middle school students to concepts related to electricity. NTE Energy was on hand Oct. 18 to support the Orangeburg (South Carolina) Chamber of Commerce as a major sponsor of the Chamber’s Cup Golf Tournament. The annual event – which had been rescheduled due to Hurricane Michael – benefits the chamber’s economic development efforts to support local businesses. As autumn begins, progress continues on the Killingly Energy Center’s minor modification request with the Department of Energy and Environmental Protection. On Sept. 28, ISO New England formally approved the Killingly Energy Center to participate in the February 2019 forward capacity auction. Held every February, these forward capacity auctions ensure that New England’s power system has the resources available to meet the region’s future energy needs. NTE Energy looks forward to participating in the upcoming auction and the continued development of the Killingly Energy Center – a highly efficient facility that will provide cleaner, more affordable energy as well as significant economic development benefits to the entire region. For more information on the Killingly Energy Center project – including copies of the minor modification request, community presentations and other key resources – please visit http://www.killinglyenergycenter.com. The historic city of Camden, South Carolina became the latest municipality to join the NTE family. On Sept. 25, the Camden City Council voted unanimously to end its century-long relationship with Duke Energy in favor of a long-term power purchase agreement with NTE. Under the terms of the 20-year agreement, NTE will supply all of Camden’s energy needs from the company’s fleet of energy facilities, including the Kings Mountain Energy Center in Cleveland County, North Carolina; and Reidsville Energy Center – a 500-megawatt natural gas-fired plant currently under construction in Rockingham County, North Carolina. Each facility has the capacity to power 450,000 homes. In the wake of Hurricane Florence, thousands of Carolinians were displaced from their homes as strong winds and catastrophic flooding inflicted billions of dollars in damage to the region. To support relief efforts, NTE Energy and its development partners donated more than $65,000 to the Salvation Army, which was providing food, shelter and other assistance to families and first responders in both North and South Carolina. “While many of the communities we serve were thankfully spared the worst of the storm damage, we know that nearby cities and towns were not so fortunate,” said Michael Green, NTE senior vice president for the Carolinas. “A donation to support the immediate aid being provided to families that evacuated and are in need of food and shelter seemed to be the best way we could help folks. We hope everyone had an enjoyable Labor Day Holiday. During August, work continued with the Department of Energy and Environmental Protection on the air permit minor modification request and with the ISO New England’s Independent Market Monitor (IMM) to prepare and gain approval for KEC’s participation in next February’s auction. Just a reminder that the Killingly Energy Center’s minor modification request, a copy of the presentation we made at Killingly High School on June 20 and other project documents can be found on the project website under the Resources tab (www.killinglyenergycenter.com). The Killingly Energy Center is positioned to provide private investment and economic development to the town, region and state - while producing a cleaner and more affordable source of energy. As the retirements of up to 6,000 MW of older and less efficient power generating units loom in the near future, the Killingly Energy Center will be critical in providing much needed dispatchable baseload power to protect the reliability of electric grid, flexibility to help integrate renewable resources and energy to meet Connecticut’s and the region’s future needs. As always, if you have any questions please contact me at (813) 503-2991 or teves@nteenergy.com. In July, we filed a request to the Department of Energy and Environmental Protection for a minor modification of KEC’s air permit to incorporate improvements in the project. Copies of the minor modification request are available under the Resources tab on the project website (www.killinglyenergycenter.com) and in the Killingly Town Hall and Killingly Public Library. The improvements addressed in the minor modification request were discussed at the June 20th public meeting at the Killingly High School and are described in the “Public Meeting Presentation 6/20/18” found on the project website under the Resources tab. In addition, we continue to work with the ISO New England’s Independent Market Monitor to prepare KEC for participation in next February’s auction (FCA 13). Happy 4th of July. We wish you all a safe and fun holiday. On June 20, we held another public meeting in the Killingly High School auditorium. After a brief presentation on the improvements made to the proposed project, the NTE team members answered questions and responded to concerns from the folks in attendance. The presentation is posted on the Killingly Energy Center website www.killinglyenergycenter.com. You will also notice that additional information has been added to the frequently asked questions (FAQS) section of the website. KEC is preparing to submit our request for a minor modification to its air permit to incorporate the project improvements discussed during the June 20 public meeting and as described in the presentation on the website. Once submitted, targeted for mid-July, NTE will post the modification request on the website and will place copies in the Killingly Public Library and Town Hall. May was another busy month for the Killingly Energy Center (KEC) project. On May 8, we provided an update on the project status and schedule to the Killingly Town Council during their regular scheduled and televised meeting. The update included a short period of questions and answers with the Town Council members. KEC is preparing to submit an application to modify its air permit to incorporate project improvements. In support of this planned modification application, NTE submitted an Environmental Justice Plan to the Department of Energy and Environmental Protection for their review and approval. Copies of the EJ Plan will be available for public review at the Killingly Town Hall and Killingly Public Library. As a part of the EJ Plan, NTE will be holding another public informational meeting on Wednesday, June 20, 2018 at the Killingly High School, 226 Putnam Pike Road, starting at 7 pm. Members of the KEC team will make a presentation on the improved project followed by a question and answer session. We look forward to seeing members of the community at the public information meeting. As always, if you have any questions please contact me at (813) 503-2991 or teves@nteenergy.com. The Killingly Energy Center continues to move forward as we prepare for ISO New England's Forward Capacity Auction (FCA 13) early next year. We appreciate the hard work the Town of Killingly has dedicated toward this project over the last two years, and the valuable input we have received from the Town Council and members of the community. Thanks to their hard work, we have reached agreement on a Tax Stabilization Agreement and Community Environmental Benefit Agreement (CEBA) that will bring in over $102 million in cash to the Town and the Williamsville Fire District over twenty-three years, once construction begins. The Killingly Energy Center will provide over $500 million in critical private investment and economic development, while producing a cleaner and more affordable source of energy. With up to 6,000 MW of older, and less efficient, power generating units coming off line in the near future, the Killingly Energy Center will provide much needed power to protect the reliability of the electric grid, flexibility to help integrate wind and solar resources, and energy to meet Connecticut's, and the region's, future needs. We will continue to keep the community informed and updated as to our progress. As always, if you have any questions please contact me at (813) 503-2991 or teves@nteenergy.com. The NTE team continues its efforts in the development of the Killingly Energy Center. Current efforts are centered around permitting activities, community outreach, and increasing the competitiveness of the project through technology as we prepare for FCA 13. ISO-NE has identified over 6600 MW "at risk" of retiring - this represents almost 20% of the region's capacity requirement. Of these "at risk" units are five oil burning units located in Connecticut, with a combined generating capacity of 1300 MW and an average age of more than 50 years old. The Killingly Energy Center will provide critical generation capacity for Connecticut and the region to replace these "at risk" units, and will do so with a cleaner, more efficient, and more affordable source of energy. The Killingly Energy Center will provide much needed dispatchable power, ensuring the reliability and operating flexibility of the electric grid, as important new renewable generation is integrated. If you have any questions or comments, please contact me at (813) 503-2991 or teves@nteenergy.com. On February 5, ISO New England, the regional transmission system operator, ran their Forward Capacity Auction #12 (FCA12). Although the Killingly Energy Center was the only major new facility that bid into the auction - and was priced at a very competitive level – it was not selected to receive a Capacity Supply Obligation. Of course, we were disappointed – but this is only a temporary delay. While disappointed, we are not deterred. The fact is, the Killingly Energy Center was in a much better position to compete in FCA12 than it was last year (2017) in FCA11 - and it will be in an even stronger position to compete in next year's FCA13 – which will be held in February, 2019. We will continue to work on the development of our project to make it even better as we prepare for next year’s auction. The Killingly Energy Center will provide critical private investment and economic development - while producing a cleaner and more affordable source of energy. With up to 6,000 MW of older and less efficient power generating units coming off line in the near future, the Killingly Energy Center will provide much needed dispatchable baseload power to protect the reliability of electric grid, flexibility to help integrate wind and solar resources and energy to meet Connecticut’s and the region’s future needs. We appreciate the efforts of the Town of Killingly and the valuable input we have received from members of the community. We will continue to keep the community informed and updated as to our progress. The New Year has gotten off to a good start for the Killingly Energy Center Project. The Town of Killingly Town Council approved the Tax Stabilization Agreement (TSA) and Community Environmental Benefit Agreement (CEBA) at its meeting on January 9. These two agreements, plus the taxes to be paid to the Williamsville Fire District, will bring in over $102 million in cash to the Town during the three year construction and first 20 years of operation periods. In addition, the CEBA will bring considerable non-cash benefits to the Town. Both the TSA and CEBA are posted to the KEC website (www.killinglyenergycenter.com). On January 19, NTE filed a motion with the Connecticut Siting Council to reopen Docket No. 470 for the Killingly Energy Center. The CSC is scheduled to discuss the motion at its February 15 meeting. In addition, NTE filed Addendum 1 to its Environmental Justice (EJ) Final Report on January 29, completing the EJ process. Copies of the complete motion and Addendum 1 has been posted to the KEC website and paper copies have been placed at the Killing Town Hall and Killingly Public Library for public access and review. We are preparing for the ISO-New England’s Forward Capacity Auction #12 to be held on February 5 and will publish the results in the March Newsletter. We held another Public Informational Meeting on December 18. Project team members were on hand at the Killingly High School to provide a status update on the project and to address question and comments from the public. A copy of the presentation can be found on the project website (www.killinglyenergycenter.com) under the resources tab. During December, DEEP provided the project a Notice of Sufficiency, acknowledging that our air permit minor modification application was complete. The review of this application, which will result in an even cleaner project, is now underway by DEEP. The application is also available for review on the project website and at the Killingly Town Hall and the Killingly Public Library. We are planning to file of our motion to reopen the project’s Siting Council application later this month. Work is progressing on preparing the filing. The Killingly Energy Center will be an important new generation asset for Connecticut - to address older plant retirements, enhance system reliability with its firm gas supply and backup Ultra Low Sulfur Diesel, assist in the integration of wind and solar assets with its operation flexibility, and to provide critical economic development to Killingly and the State of Connecticut. Project activities continue to progress and during November, we filed a minor modification application to DEEP on our air permit, which will result in an even cleaner Killingly Energy Center (KEC). The application is available to the public at the Killingly Town Hall, the Killingly Public Library, and on the KEC website under the "Resources" tab. With the upcoming filing of our motion to reopen the project’s Siting Council application, we have scheduled a Public Informational Meeting on December 18 at 7pm. The meeting will be held in the Killingly High School auditorium, 226 Putnam Pike, Killingly, and will provide an opportunity for residents to hear a project update and ask questions. KEC is an important new resource for Connecticut - to address older plant retirements, enhance system reliability, assist in the integration of wind and solar assets, and to provide critical economic development currently needed by the State. As always, if you have any questions please contact me at (813) 503-2991 or teves@nteenergy.com. You can also leave a message at “Tell Us What You Think” at killinglyenergycenter.com. During October, KEC qualified to participate in ISO New England’s Forward Capacity Auction #12 to be held in February 2018. We also finalized and executed the water supply and construction agreements with the Connecticut Water Company. We continue to work with the Town of Killingly on the Tax Stabilization and Community Environmental Benefits Agreements. We are planning and preparing to file a motion to reopen our siting council application in early January 2018. We expect that the CSC will find a need for KEC as it will provide a cleaner and more affordable source of energy that the region requires in order to compete in the 21st century as older, dirtier and less efficient power generating units retire. The Killingly Energy Center will also bring in new private investment and economic development that is critical to our state. As always, feel free to contact us at (813)503-2991 or teves@nteenergy.com. You can also leave a message at “Tell Us What You Think” at killinglyenergycenter.com. Progress on the development of the Killingly Energy Center continues as we work towards preparing and qualifying for ISO New England’s Forward Capacity Auction 12 in February of 2018. The Killingly Energy Center will provide new and critical private investment and economic development that our state so desperately needs, while producing a cleaner and more affordable source of energy that the region so urgently requires in order to compete in the 21st century. With up to 6,000 MW of older, dirtier and less efficient power generating units coming off line in the near future, the Killingly Energy Center will provide much needed power to protect the reliability of electric grid and to meet Connecticut’s and the region’s future energy needs. During August, the Killingly Energy Center (KEC) began working with ISO – New England’s Independent Market Monitor to prepare and qualify for Forward Capacity Auction 12 (FCA12), which will be held in February 2018. Following FCA12, KEC will file to reopen its Siting Council proceedings and is confident that the CSC will determine that there is a need for KEC - based on FCA12 results, potential retirements, concerns with system reliability and the need to integrate intermittent renewable resources. KEC, a new, cleaner and more efficient power generating facility, will help the State of Connecticut meet these needs. KEC continues to make progress on all its contractual discussions with the Town of Killingly on the Tax Stabilization and CEBA Agreements, Connecticut Water on water supply, Yankee Gas on gas supply and Eversource on the electrical interconnection, and the Department of Energy and Environmental Protection continues its review of KEC’s waste water permit and water quality certificate applications. NTE Energy was pleased to be a sponsor of Killingly’s Bike Night and was happy to participate in another very successful Killingly event! July was an eventful month for the Project. The Department of Energy and Environmental Protection (DEEP) issued the final air permit for the Killingly Energy Center (KEC). The Town of Killingly took action at their July 11 Town Council meeting to continue negotiations with NTE to finalize the Tax Stabilization and CEBA agreements. DEEP continues its review of KEC’s waste water permit and water quality certificate applications. Progress was made in contractual discussion with Connecticut Water on water supply, Yankee Gas on gas supply and Eversource on the electrical interconnection. Uncertainty continues with regard to Connecticut’s ability to reliably meet its electrical load over the coming years. Up to 6,000 MW of older, dirtier and less efficient power generating units will soon retire in New England. The retirement of these units, as well as ongoing concerns about seasonal reliability and the integration of intermittent renewable resources will reinforce the need for KEC – a newer, more efficient and cleaner power generating facility. NTE Energy plans to file to reopen the Project’s Connecticut Siting Council (CSC) proceedings in early 2018 and is confident that the CSC will determine that there is a need for KEC. Development of the Killingly Energy Center continues to move forward. The Department of Energy and Environmental Protection is completing its review of KEC’s air permit and is processing KEC’s water quality certificate application. Contractual discussion with Connecticut Water on water supply, Yankee Gas on gas supply and the Town of Killingly on the tax stabilization and community benefits agreements are proceeding well. KEC will improve the reliability of the electric supply in Connecticut by offsetting the upcoming retirements of older coal and oil fired generating plants, helping to integrate intermittent solar and wind renewable generating resources, and improving wintertime reliability. NTE Energy is confident that the Connecticut Siting Council will determine that there is a need for KEC when the project files to reopen its CSC proceedings. As you may know, the Connecticut Siting Council (CSC) recently voted to deny the Killingly Energy Center’s (KEC’s) application, without prejudice, based on their perception that there is currently a lack of need for this new source of energy. The form of this decision provides NTE the opportunity to file to reopen the CSC docket at a later date. NTE is confident that up to 6,000 MW of older, dirtier and less efficient power generating units will retire in the ISO New England region, and that these retirements, coupled with seasonal reliability and renewables integration concerns, will support the need for KEC – a newer, more efficient and cleaner power generating facility. Once NTE secures a capacity supply obligation, further demonstrating need for the new power generation from KEC, NTE will file to reopen the CSC docket. In other permitting news, the Connecticut Department of Energy and Environmental Protection (CTDEEP) is in the process of preparing the final air permit for KEC. We expect CTDEEP to issue the final KEC air permit later this month. We continue to work to finalize the Tax Stabilization and Community Environmental Benefit Agreements and other project agreements. We also enjoyed a good, fun (chilly) day at the Killingly-Brooklyn Rotary 24th Annual Spyder Burke Memorial Golf Tournament. As always, feel free to contact us with any questions or comments at (813) 503-2991 or teves@nteenergy.com. In April, progress continued to be made in the siting certification and air permitting, as well as other late stage development activities. As always, feel free to contact us with any questions or comments at (813) 503-2991 or teves@nteenergy.com. The Connecticut Department of Energy and Environmental Protection (CTDEEP) held a public comment hearing for the Killingly Energy Center (KEC) on April 19 at the Killingly High School auditorium. A good number of citizens attended the meeting and made their comments directly to CTDEEP regarding CTDEEP’s issuance of the Tentative Determination (draft air permit). CTDEEP staff is preparing responses to all comments received, both written and oral, with a final ruling expected later in May or June. On April 27, the CSC held their first day of deliberations on KEC’s Siting Certification Application. The CSC’s next deliberation is expected to take place during one of their next regularly scheduled meetings in May, at the CSC’s New Britain’s offices. Discussion and negotiations on the Tax Stabilization Agreement and Community Environmental Benefit Agreement continue. We appreciate the Town’s diligence in completing these agreements and look forward to finalizing these with the Town. In March the project completed several key milestones in the siting certification and air permitting processes and continued moving forward on the Community Environmental Benefit and Tax Stabilization Agreements with the Town. As always, feel free to contact us with any questions or comments at (813) 503-2991 or teves@nteenergy.com. On March 23, the CSC held the final evidentiary hearing for KEC. NTE representatives answered questions from the Councilors, NAPP and the Sierra Club, regarding ISO New England’s Forward Capacity Auction #11 results. Following this final hearing, the CSC established a close of record date of April 24 with their deliberations and decision expected before summer. Connecticut Department of Energy and Environmental Protection (CTDEEP) issued the Tentative Determination (draft air permit) and notice of public hearing for KEC. The public hearing will take place on April 19 at the Killingly High School auditorium starting at 6:00 pm. The purpose of the public hearing is to provide an opportunity for members of the public to make comments concerning the Tentative Determination directly to CTDEEP. The hearing will be moderated and recorded by a CTDEEP hearing officer. Comments will be heard in the order in which members of the public sign up at the hearing. Written comments will be accepted at the hearing and by CT DEEP until the close of business on April 26. After the hearing is closed, CTDEEP staff will prepare a response to comments, and document and issue their recommendation. A copy of the Tentative Determination can be found on the CTDEEP website and also on the KEC website at www.killinglyenergycenter.com/apps-and-permits. Work on the Community Environmental Benefit Agreement (CEBA) and the Tax Stabilization Agreement continues to move forward. After two scheduled Town Council meetings were cancelled due to snow storms, the Town Council met on March 21 to take public comment and discuss both agreements. NTE is looking forward to finalizing negotiations of these two agreements with the Town. February was another exciting month for the project on several fronts - from the Forward Capacity Auction, to our discussions on the Community Environmental Benefit and Tax Stabilization Agreements with the Town, to our innovative commitments on greenhouse gas reductions. As always, feel free to contact us at (813) 503-2991 or teves@nteenergy.com. ISO New England held its Forward Capacity Auction #11 on February 6. FCA #11 produced positive results for Connecticut rate payers, providing reliability for the region and stability of the electric grid. FCA #11 also illustrated that the market fundamentals for new generation in Connecticut and New England remain strong with significant coal and oil-fired power generation retirements expected, steady growth in renewables and energy efficiency programs, desired reductions in greenhouse gas emissions and concerns with winter reliability. FCA #11 required that facilities receiving capacity supply obligations from the auction be in operation by June 2020 - an aggressive goal for KEC, with key permits and agreements outstanding. Completion of these permitting processes and agreements over the next several months will position KEC for participation in FCA #12. We are pleased to have participated in the auction and are looking forward to KEC being a long-term low-cost resource in New England. KEC will be a key contributor towards the goal of creating competitive electricity prices and providing reliability for consumers while leading the way on emissions reductions for years to come. KEC will support the State of Connecticut's compliance with the Global Warming Solutions Act of 2008. We have made a voluntary commitment to make an 80% reduction in KEC's GHG emission levels by 2050. In addition, we have committed to retiring KEC in 2050 or otherwise operating it with no net greenhouse gas emissions. Our commitment serves as a new paradigm of environmental stewardship for the energy industry. NTE's voluntary reductions will cause KEC to operate less over time, purchase offsets, and advance carbon-free technologies. This assures that, although natural gas power generation has its place as a clean, cost-effective baseload power generation source, the growth of renewable power generation and GHG emission free sources remains the priority in helping create a clean economy for future generations. "NTE has always been extremely committed to environmental stewardship and renewable power generation," said NTE CEO Seth Shortlidge. "Our decision here is greater than economics, or the current benefits of natural gas power generation. This is about being a leader and challenging other power generators to be even more accountable for today's energy needs and tomorrow's effects on global warming." Work on the Community Environmental Benefit Agreement (CEBA) and the Tax Stabilization Agreement is moving forward. Under the terms of the CEBA, KEC will provide over $5 million in benefits to Town - which include payments to the Town for use on community improvement projects, a 20-acre conservation easement and security for the future decommissioning of KEC. Under the terms of the Tax Stabilization Agreement, KEC will pay a fixed series of payments totaling $90 million over the 3 year construction period and first 20 years of operation. These payments reflect the Town's best approximation of the projected tax liability of the KEC. In addition, NTE has committed to provide a Property Value Guarantee to the neighbors of KEC. More information on the Property Value Guarantee will be available soon. Within ISO New England, power generators like KEC produce two products: energy and capacity. Energy is what is produced whenever the project is operating. Capacity is the ability to produce energy. Power generation sources in the region, like KEC, are paid by ISO New England for being available, in other words for capacity. Payment for capacity is a consistent concept throughout the country's electricity systems, with the goal to create reliability, attract new power generation investment, create efficiency within the fleet of power generation sources, and reduce future emissions. In ISO New England, the pricing for this capacity is established every year in the Forward Capacity Auction. We've had an eventful month with Connecticut Siting Council (CSC) hearings, visits with community members, discussions on the Community and Environmental Benefits Agreement, and meetings with the Town. As always, feel free to contact me at (904) 436-6889 or dgroleau@nteenergy.com. We met with the Williamsvile Fire Department to discuss the project and the benefits that it will bring to the fire district and the community. Thanks to Chief Cooper for giving us a tour of the Williamsville firehouse, which we enjoyed. We've also been in discussions with the Town Manager regarding taxes, the Community Environmental Benefits Agreement and other agreements. Click here to read about his interview with the Norwich Bulletin: http://www.norwichbulletin.com/news/20170110/killingly-officials-sketching-tentative-contracts-with-power-plant-company. Our team participated in two evidentiary hearings this month on January 10th and 26th. No further evidentiary hearings are scheduled and the evidentiary record has now been closed. As always, you can access the transcript of the hearing on the CSC docket website here: http://www.ct.gov/csc/cwp/view.asp?a=962&Q=583908&PM=1. Up to 30%, or approximately 10,000 megawatts of regional coal and oil-fired electricity generation could be gone by 2020 due to facility retirements. Approximately 25% of these retirements will be facilities in Connecticut alone. More clean and efficient power generation facilities, like the Killingly Energy Center, are needed to fill the void left by these retiring facilities. The flexible nature of the project, while helping to fill this void, also improves reliability throughout the region and supports the further development of renewable resources. We hope everyone had a Happy Holiday Season! It's been our privilege getting to know and work with so many of you throughout 2016, and we are looking forward to our continued relationships in 2017. If you have questions or would like to discuss the Killingly Energy Center, please feel free to contact me at (904) 436-6889 or dgroleau@nteenergy.com. On December 15th, we participated in our third Connecticut Siting Council (CSC) evidentiary hearing. You can access the transcript of the hearing on the CSC docket website here: http://www.ct.gov/csc/cwp/view.asp?a=962&Q=583908&PM=1. The next evidentiary hearing is to be held on Tuesday, January 10th; it's scheduled for 11:00am at the office of the Council, 10 Franklin Square, New Britain, Connecticut, in Hearing Room One. Thanks to everyone who cam eout to present suggestions related to the Community Environmental Benefit Agreement on November 30th. There were a lot of great ideas from community members. We're excited to see how the Town chooses to apply the funds for the benefit of the community. We submitted the application for our Wastewater Discharge Permit to the Connecticut Department of Energy and Environmental Protection on December 19th. If you haven't visited our website in a while, make sure to check out some recently published information. We uploaded the Environmental Justice Plan Final Report, and our Wastewater Discharge Permit Application. See our Resources page here: http://killinglyenergycenter.com/resources/. We hope everyone had a wonderful Thanksgiving last week with family and friends. November was another eventful month, mostly focused around evidentiary hearings with the Connecticut Siting Council. If you have questions about the process or would like to discuss the Killingly Energy Center, please feel free to contact me at (904) 436-6889 or dgroleau@nteenergy.com. The Connecticut Siting Council (CSC) conducted the first evidentiary hearing session on Thursday, November 3rd, 2016. A second evidentiary hearing session was held on Tuesday, November 15th, 2016. Hearing transcripts are available on the Killingly Energy Center Docket website: http://www.ct.gov/csc/cwp/view.asp?a=962&Q=583908&PM=1. These hearings involve testimony from Killingly Energy Center representatives, and include questions from CSC members as well as parties who have been approved to participate in the process. The next hearing is scheduled for 11:00am on December 15th at the office of the Council, 10 Franklin Square, New Britain, Connecticut, in Hearing Room One. The CT Department of Energy and Environmental Protection (CT DEEP) continues their review of the Killingly Energy Center Air Permit Application. As a part of the CT DEEP process, NTE is required to provide its Environmental Justice Plan Final Report (Final Report) to CT DEEP, which summarizes our extensive community outreach activities and implementation of the Killingly Energy Center Environmental Justice Plan. NTE plans to submit the Final Report in early December and it will also be posted on the project website. As always, if you would like to discuss the project or have questions, my cell phone is (904) 325-5522 and my email is dgroleau@nteenergy.com - don't hesitate to reach out. Or, feel free to tell us what you think at http://killinglyenergycenter.com/telluswhatyouthink/. October was an eventful month with all activities associated with our Connecticut Siting Council application. The CSC review process is well underway. If you have any questions about the process or would like to discuss the Killingly Energy Center, please feel free to contact me at (904) 436-6889 or dgroleau@nteenergy.com. On October 20, the Connecticut Siting Council (CSC) hosted a Public Field Review at the proposed site of the Killingly Energy Center. Council members and community members walked the site with experts from NTE. That evening, the CSC hosted a Public Comment Hearing Session where community members were able to provide input to the CSC and voice their concern for the Project. The Council will conduct an evidentiary hearing session on Thursday, November 3, 2016, beginning at 11:00 a.m., at the office of the Council, 10 Franklin Square, New Britain, Connecticut, in Hearing Room One. The evidentiary hearing, if required, will continue on November 15, 2016, also to be held at the CSC's New Britain offices. As mentioned in previous Newsletters, our application and related filings from all parties are available for review on the CSC website at http://www.ct.gov/csc/cwp/view.asp?a=962&Q=583908&PM=1. On October 11th at the Town Council Regular Meeting, NTE presented a summary of economic benefits that the project would provide to the Town of Killingly, including the highlights of its proposed Community Environmental Benefits Agreement. NTE also answered questions from Town Council Members. This presentation is available on our website here. Additionally, on October 19th, NTE hosted an additional public meeting at KHS. At this meeting, NTE responded to written community questions submitted to the Administrator of the Environmental Justice Program. Once NTE answered these questions, the remainder of the meeting was open to other questions from the audience. Between Town Commission, Town Council and CSC meetings this month, we realize you're taking valuable time out of your schedule to engage in this project. Thank you for your input and questions. We've enjoyed getting to know many of you and appreciate your feedback. As always, if you would like to discuss the project or have questions, my cell phone is (904) 325-5522 and my email is dgroleau@nteeenergy.com - don't hesitate to reach out. Or, feel free to tell us what you think here. We've had an eventful September attending Town Commission and Council meetings, meeting with community members, touring the wastewater treatment facility and attending the Great Tomato Festival. As always, if you would like to discuss the Killingly Energy Center or ask questions about the project, please contact me at (904)-436-6889 or dgroleau@nteenergy.com with questions or to set up a meeting. Our Connecticut Siting Council (CSC) Application (submitted on August 17th) kicked off the CSC's formal project review, which includes opportunities for community input and public participation. We've attended several meetings this month with the Planning and Zoning and Inland Wetlands and Watercourses Commissions. These Commissions will provide recommendations to the CSC to consider in their review. We appreciate the time and energy the Commissions are putting into this process. There are also few upcoming public CSC activities to note. The CSC will conduct a Public Field Review at the project site (189 Lake Rd.) on October 20, 2016 at 3:30 p.m. The public is welcome to attend this site walk. Additionally, the CSC will hold a Public Comment Hearing Session on October 20, 2016, at 6:30 p.m. at the Killingly High School Auditorium, 226 Putnam Pike, Killingly, CT. We look forward to a robust review process and to continuing our engagement with local residents, elected officials and community leaders. If you are interested in reading our application, a copy can be reviewed at Killingly Town Hall or Public Library, at the CSC's office in New Britain, CT or on-line http://www.ct.gov/csc/cwp/view.asp?a=962&Q=583908&PM=1. Last week, a few of our team members toured the Killingly wastewater treatment plant to understand the viability of using this source for our limited water needs. Our team is further evaluating this as an alternate option for water supply. Thanks to the Water Pollution Control Authority for taking time to meet with our team. Don't forget to check out our website. We've posted more content, including an FAQ that summarizes many of the questions we've heard from the community - http://killinglyenergycenter.com/frequently-asked-questions/. We've also included a Benefits page that helps describe how the Town of Killingly benefits from the Killingly Energy Center - http://killinglyenergycenter.com/benefits/. We had a great time at the Great Tomato Festival on September 10th! My daughter especially enjoyed the bouncy house and endless crafts to community provided. We look forward to continuing sponsoring and participating in great community events like this. We've had another busy month meeting with community members and preparing and submitting our Connecticut Siting Council application. As always, our team members are in Killingly nearly every week; if you would like to discuss the Killingly Energy Center or ask questions about the project, we would be happy to meet with you. Please contact me at (904) 436-6889 or dgroleau@nteenergy.com with questions or to set up a meeting. We submitted our application to the Siting Council on August 17. As the application demonstrates, we're developing one of the cleanest, most efficient natural gas power generation facilities in North America. Our project will create important economic benefits and employment opportunities for Killingly and surrounding communities. It will also help to displace dirty coal and oil plants, improving Connecticut’s air quality. This clean and efficient facility will reduce Connecticut electricity costs and improve regional electric reliability. Our application kicks-off the Siting Council's formal project review, which includes numerous opportunities for community input and public participation. This formal review process will include a site visit from the Siting Council and a public hearing, both of which we will announce in upcoming newsletters. We look forward to a robust review process and to continuing our engagement with local residents, elected officials and community leaders. 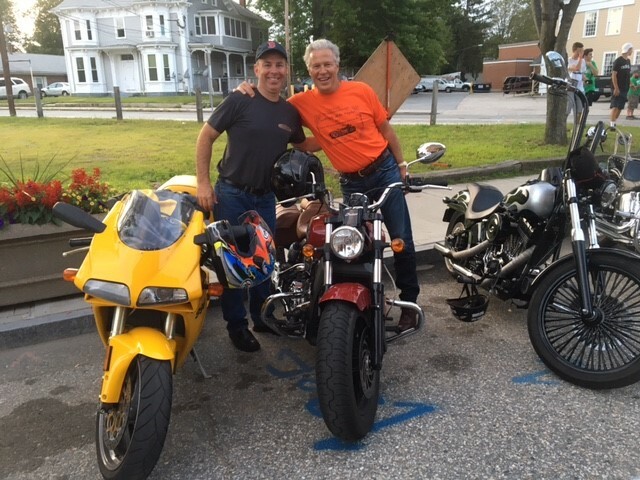 Our team enjoyed sponsoring and attending Killingly's 2nd annual Bike Night, held on August 18th. With over 1,200 motorcycles and 4,000 people, the event brought in riders from all over the region! We also attended the Northeast Connecticut Chamber of Commerce Business After Hours networking event and enjoyed meeting with the local business community. Finally, we're excited to be sponsoring and participating in the annual Killingly Great Tomato Festival on September 10. Hope to see you there! We've had a busy month finalizing reports, presenting to community members and Town Commissions, as well as engaging in several other meetings with community members. As always, our team members are in Killingly nearly every week; if you would like to discuss the Killingly Energy Center or ask questions about the project, we would be happy to meet with you and would appreciate your input. Don't hesitate to contact me at (904) 436-6889 or dgroleau@nteenergy.com with questions or to set up a meeting. As many of you know, we had two public presentations in July. On July 11th, we held a Public Project Meeting, which was a forum for our team to present the latest project information and to address the community's questions. The second meeting was a Special Joint meeting on July 19th, which was an opportunity for the Town's Inland Wetland & Watercourses and Planning & Zoning Commissions to review the status of the project and ask questions. We appreciate the community's thoughtful questions and discussion during these meetings. There will be more opportunities for public engagement over the next several months. Don't forget to regularly visit our Resources page. We've posted our recent presentations, our site plan and site arrangement, as well as a few other content pieces over the last few weeks. Last month, we met with several community members interested in learning more about the project. From educational institutions to churches, from local residents interested in working at the facility, to community members who may have concerns, we appreciate the engagement of the community. The invitation for you to meet with us is always open. As discussed at the recent meetings, we are planning to file our Connecticut Siting Council (CSC) Application in early/mid-August. This will begin the 65-day period for the Killingly Planning & Zoning and Inland Wetlands & Watercourses Commissions to provide recommendations and comments to the CSC for consideration. As we finalize the application, we will give public notice of our intent to file in the Norwich Bulletin. Lastly, on August 18th, we are sponsoring and participating in Killingly's 2nd Annual Bike Night. We hope to see you there! This issue of the Killingly Energy Center Newsletter highlights current project activities and updates to keep community members informed on our progress. Our team members are in Killingly nearly every week and if you would like to discuss the project or ask questions about the Killingly Energy Center, we would be happy to meet with you and would appreciate your input. Don't hesitate to contact me at (904) 436-6889 or dgroleau@nteenergy.com with questions or to set up a meeting. Several of our team members have been on the site this past month finalizing studies as part of the Connecticut Siting Council process. From historians to electrical engineers, from ecologists to scientists, we have been working hard to complete a variety of studies for public review and discussion. Next week, you'll see a new project sign up with NTE contact information. Two additional signs are also posted on the site advertising our upcoming public project meeting on July 11th. This past month, we've presented to the Killingly Business Association and the Economic Development Commission. We also participated in the Killingly-Brooklyn Rotary Annual Golf Tournament, and are proud to be sponsoring Killingly's Red, White and Blue BBQ on July 1st. We're happy to announce that project reports are now complete and have been posted on the website. Throughout the past week, the following reports have been posted: Analysis of Need and Economic & Environmental Impacts, Hydrogeologic Water Evaluation, Sound Survey and Analysis Report, Traffic Impact Report, Visual Impact Assessment, and Wetland Report: Existing Conditions. You'll also find our Air Permit Application and Ambient Air Quality Analysis (Attachment L) on the website, as well as other project documents. Please visit the Resources page on our website to find the most up-to-date studies and reports, as well as other project information and background materials: http://killinglyenergycenter.com/resources/. Each of these reports will be highlighted as part of the discussion at the July 11th meeting. NTE will be hosting a public project meeting on July 11th at 7pm at the Killingly High School Auditorium at 226 Putnam Pike, Killingly, CT 06241. We invite everyone in the community to attend, learn more about the project and ask questions. We'll have a full team of experts on-hand to provide detailed project information. On July 19th, we'll be participating in a special joint meeting with the Killingly Planning & Zoning Commission and Inland Wetlands & Watercourses Commission. This meeting will be held at the Killingly High School Auditorium at 226 Putnam Pike, Killingly, CT 06241 at 7:00pm. We will submit our Connecticut Siting Council Application later in July, after the meetings on July 11th and 19th. Community members will have an opportunity to provide comments directly to the Connecticut Siting Council as they evaluate our application. Welcome to the inaugural issue of our newsletter! Our team is excited to share project updates via this periodic newsletter to keep community members up-to-date on our current activities. We are in Killingly nearly every week providing presentations, meeting with community members and groups, and participating in community events. If you would like to discuss or ask questions about the Killingly Energy Center, we would be more than happy to meet with you. Don't hesitate to contact me at (904) 436-6889 or dgroleau@nteenergy.com. We've had several teams on the site this month conducting various studies to support permitting and development work. We recently completed a geotechnical study which examines the soil and geology on the site. Over the next several weeks, our ecologists will be on-site to conduct ecological field surveys to identify any sensitive habitats and wildlife. As with all of our studies, we will make reports on this study publically available at the Killingly Public Library and on our project website once completed, expected to be in July. You may have recently noticed some traffic monitors near the site. In late May, we conducted a traffic study to understand the current traffic volume and patterns in the vicinity of the site. Our consultants are in the process of preparing a report on any potential effects on traffic which we will make publically available when complete, expected in late June. We've received a number of questions from the community related to water - water use, sources, volumes, lake levels and many others. We're actively researching water supply options, including the use of an existing wastewater stream to provide at least a portion of our need. We're planning to release a report by the end of June that will provide detailed information on water source, use and volumes. Also, shortly we will place a large, permanent sign on the property so that anyone driving by knows who to contact with questions or comments. There are a few upcoming public meetings over the next few weeks that we'd like to tell you about. On July 11, we will be hosting a public project meeting to follow up to our Informal Public Meeting of May 4, 2016. At this project meeting, we intend to share additional project information and respond to further questions from the community. We are excited about having a more detailed discussion at the upcoming project meeting as we expect many of our project-specific studies will be available at that time. We are also participating in a special joint meeting on July 19 with the Killingly Planning and Zoning Commission and Inland Wetlands and Watercourses Commission rescheduled from a meeting that was planned for June 27. Both of these meetings will be held at the Killingly High School Auditorium at 226 Putnam Pike, Killingly, CT 06241.